Hydrogen Powered Resurfice Corp and LSK Enterprises, Inc. The Olympia® eP-ICEBEAR, the world’s first ever hydrogen fuel cell-powered ice resurfacer was displayed at the 2006 NARCE Trade Show in Chicago, IL. 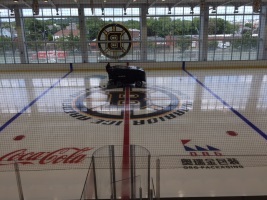 The eP-ICEBEAR project was managed by ePower Synergies, Inc. of Cordova, Illinois and Resurfice Corporation of Elmira, Ontario, manufacture of Olympia Ice Resurfacers. The eP-ICEBEAR is ideal for indoor use due to its zero-emissions power train that produces water as its only form of exhaust. The Olympia IceBear combines the Olympia’s world leading ice resurfacing technology with the IceBear cutting edge electric vehicle components. In response to an industry demand for a pollution free, safe, efficient, cordless electric powered ice resurfacer, the Olympia eP-IceBear sets a new standard in high performance and low operational costs while producing zero emissions.